On 18 March 1992, the 275th Guards Anti-Aircraft Rocket Brigade at Chișinău of the Soviet 60th Air Defense Corps, equipped with Surface-to-air missiles, became part of the Moldovan Air Force. Elements of the brigade served as air defense units in the Transnistria War. In April 1992, the Moldovan Air Force inherited the Mikoyan MiG-29-equipped 86th Guards Fighter Aviation Regiment at Mărculești Air Force Base from the Air Forces of the Black Sea Fleet. Most of the regiment's non-Moldovan personnel, including all of its pilots and its commander, departed for their home countries after its transfer. These were replaced by Moldovan personnel returning from service in the Soviet Armed Forces, among whom there were not many pilots, and even fewer pilots could fly MiG-29s. During the Transnistria War, on 22 June 1992, a flight of two MiG-29s bombed a bridge across the Dniester, connecting Bender and Parcani. None of the bombs directly hit the bridge, although the 14th Guards Army claimed that the bombs had caused civilian casualties and that their anti-aircraft fire downed one of the fighters. Moldova denied the loss, and Moldovan Air Force records show that all of the MiG-29s returned to the base after the mission. On 3 September 1993, the 275th Brigade was reorganized into the Dimitrie Cantemir Anti-Aircraft Rocket Brigade. In 1994 the Air Force consisted of 1,300 men organized into one fighter regiment, 1 helicopter squadron, and 1 missile brigade. They had 31 MiG-29 aircraft, 8 Mi-8 helicopters, 5 transport aircraft (including an Antonov An-72), and 25 SA-3/SA-5 Gammon surface-to-air missiles. On 23 December 1999, the mixed aviation brigade formed from the 86th Regiment in the late 1990s was reorganized into the Decebal Air Base. In 2002 the Air Force consisted of 1,400 men. In 2007 the Air Force had been reduced to a strength of 1,040 men organized into one helicopter squadron, and one missile battalion. They had 6 MiG-29S aircraft, upgraded in Ukraine and stationed in Mărculeşti Air Base, 8 Mi-8 helicopters, 5 transport aircraft (including an Antonov An-72), and 12 SA-3 surface-to-air missile. In March 2010, the Moldovan Air Force signed an agreement with the Romanian Air Force regarding the exchange of information about military aircraft flights near the border, the exchange of radar data, the obligation to provide mutual support to military aircraft in distress and future joint operations. By 2011, the Dimitrie Cantemir Brigade had become a regiment. Under an agreement finalized on 10 October 1997, the United States acquired 14 MiG 29Cs, described by U.S. officials as wired to permit delivery of nuclear weapons. 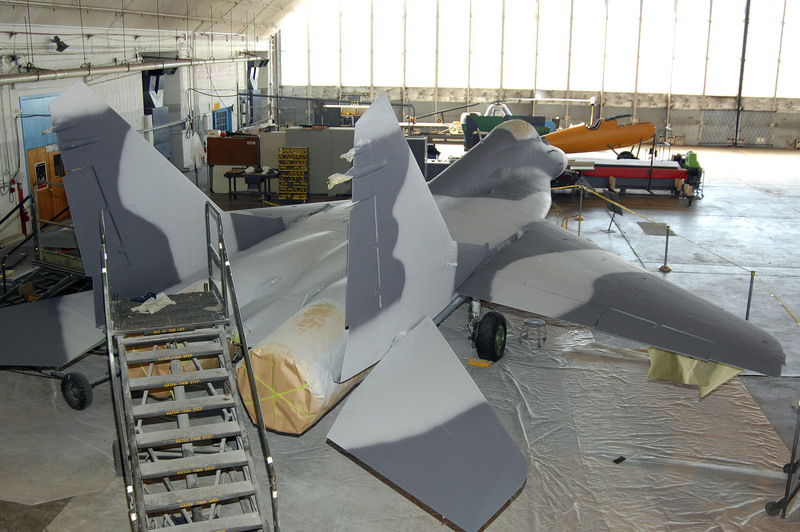 Also, the United States purchased six MiG 29As, one MiG 29B, 500 air-to-air missiles and all the spare parts and diagnostic equipment present at the Moldovan Air Base where the aircraft were stationed. In return, Moldova received around $40,000,000, humanitarian assistance and non-lethal excess defense articles, such as trucks. The purchase was not without its opponents in Moldova, and the then acting defense minister, Valeriu Pasat would later be charged for illegally selling the aircraft to the USA. All of those MiG-29s were transported from Moldova to the National Air Intelligence Center (NAIC) at Wright-Patterson Air Force Base near Dayton, Ohio in C-17 transport planes over a period of two weeks. In late 1998 Moldova also sold 10 MIG 29s to Eritrea, but it was speculated that these aircraft were no longer airworthy. In February 2012, Defense Ministry announced eight planes and eight military transport helicopters will be purchased at the cost of US$240 million. Moldavian Mi-8PS for VIP transport (former Nicolae Ceauşescu helicopter). Moldova received approximately 34 MiG-29’s from the collapse of the Soviet Union in 1991, proving too expensive to maintain, they were sold off to Eritrea, Yemen, and the United States. Other unserviceable aircraft to be placed in storage consisted of the An-2, Tu-134, and some An-24’s. Goodfellow AFB in San Angelo, Texas. The National Air Intelligence Center at Wright-Patterson AFB, Ohio. A two-seat MiG-29UB is on display. 2 MiG-29s are on display at Nellis AFB. One is at the outside of the Threat Training Facility and another, in better shape, inside a hangar alongside a MiG-23. One is currently stored in a restoration hangar at the National Museum of the United States Air Force near Dayton, Ohio. 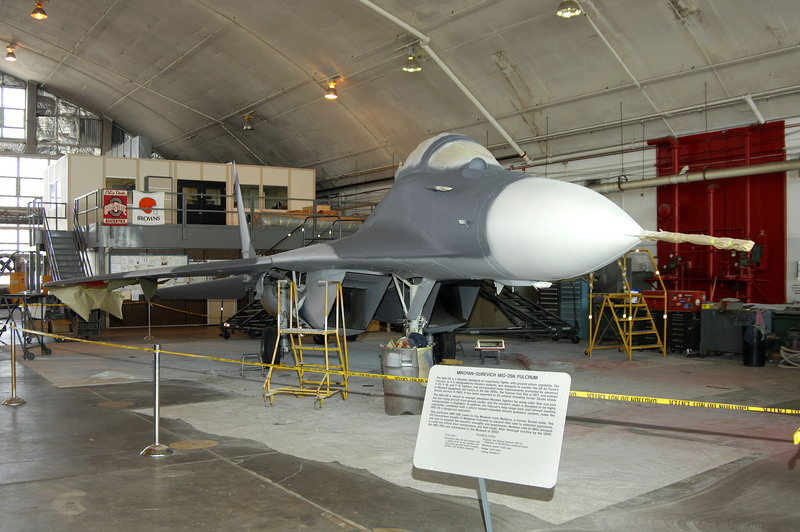 As of June 2007, the aircraft has been put in display at the Cold War Exhibit of the Museum and continues to receive minor upgrading while on display. ^ a b Admin. "275-я гвардейская зенитная ракетная бригада (в/ч 34403)". 8oapvo.net (in Russian). Archived from the original on 24 June 2017. Retrieved 30 May 2017. ^ a b Vad777. "Вооруженные силы Молдовы" [Armed Forces of Moldova] (in Russian). Archived from the original on 2 January 2013. Retrieved 30 May 2017. ^ Pavlov, Anton (15 August 2014). "86 гвардейский Краснознаменный истребительный ордена Суворова III степени Борисовский авиационный полк" [86th Guards Red Banner Borisov Order of Suvorov 3rd Class Fighter Aviation Regiment]. airforce.ru (in Russian). Archived from the original on 1 June 2017. Retrieved 30 May 2017. ^ a b Pavlov, Anton (10 September 2015). "Авиационная база "Дечебал"" [Decebal Air Base]. airforce.ru (in Russian). Archived from the original on 30 May 2017. Retrieved 30 May 2017. ^ "Moldova – The Armed Forces". country-data.com. Archived from the original on 30 September 2007. Retrieved 29 June 2007. ^ "Protocol de colaborare între forţele aeriene militare ale României şi ale R. Moldova". Mediafax.ro. Archived from the original on 9 June 2011. Retrieved 20 June 2011. ^ "Teren de joacă pentru copiii militarilor moldoveni". www.army.md (in Romanian). Retrieved 30 May 2017. ^ "U.S. Buys Moldovan Aircraft to Prevent Acquisition by Iran – Arms Control Association". armscontrol.org. Archived from the original on 10 January 2008. Retrieved 29 June 2007. ^ John Pike. "Moldova – Air Forces Command". globalsecurity.org. Archived from the original on 21 July 2015. Retrieved 19 July 2015. ^ "DoD News Briefing: Cooperative Threat Reduction Initiative". DefenseLink. 4 November 1997. Archived from the original on 2 October 2006. Retrieved 30 May 2017. ^ "Exposed: America Purchased 21 Lethal Russian Mig-29 Fighters". 13 February 2018. Archived from the original on 13 February 2018. Retrieved 13 February 2018. ^ a b c "World Air Forces 2015 pg. 23". Flightglobal Insight. 2015. Archived from the original on 24 March 2015. Retrieved 20 April 2015. ^ "World Air Forces 2004 pg. 75". flightglobal.com. Archived from the original on 27 April 2015. Retrieved 16 April 2015. ^ "The Truth About the MiG-29". airspacemag.com. Archived from the original on 27 April 2015. Retrieved 16 April 2015. ^ "Nellis Air Force Base Threat Training Facility Aircraft". richard-seaman.com. Archived from the original on 30 June 2007. Retrieved 29 June 2007.